If you had invested $1000 annually in the Dow Jones industrial index every year from 1929 to 1937 you would end up with $13,519. That amounts to an annual growth rate equivalent to about 6.5%. The Dow started around 300 in 1929 then plummeted to less than 100 by 1933. 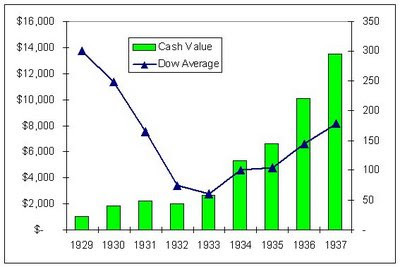 Then from 1934 to 1937 the Dow steadily grew. The green bars show the total balance of stock owned for each year. The blue plot line shows the Dow average. You can see if you steadily plowed your money into the market every year that at the end of it all your investment would have grown significantly. Notice from 1929 to 1932 your investment balance looks pretty bad. You've spent $4000 on stocks and by 1932 its worth less than $2000. Many people get scared when their money drops off significantly like that. The bottom is when a lot of people are tempted to take their money out of the market. When they do that they are effectively buying high and selling low. That is the exact opposite of what you want to do. What would have happened to your money if you got scared in 1932 and cashed in your stocks and then started investing in stock again in 1935? If you held cash from '32 to '35 then you would have missed out on buying relatively cheap stocks in '33 and '34 and then you'd miss on the growth in the equities from '32 to '35. The end result would be that if you sat on the sidelines of the market for 3 years between 1932-1935 then by 1937 your portfolio would be worth $10,801 or 20% less. What if you just sat out for 1 year? Say you watched your investment gradually go down from 1929 to 1932. Then in 1933 you say "enough!" and you sell your stocks and sit on the cash. Then in 1934 you see the market going up again so you take your cash and buy stocks again. You effectively timed it so that you missed the bottom. That might sound good but what you really missed was the opportunity to buy low. By 1937 you would have $11,085. Thats 18% less than if you'd riden it out. The best way to ride out a recession is to continue to invest your money into the market in a periodic basis. This way you can be sure to catch the opportunity to buy low and the growth of the market as it recovers high. Now keep in mind that you should only be investing in the stock market for a long term goal. If you need your money within 5 years then it should not be riding in stocks. But if your investment horizon is 10 - 40 years then stocks are a good place to invest.